Do you see the ducks in the background there? Kayloo wanted to be buds with them. She was clearly disappointed when they waddled away in uncoordinated terror. She even managed to look a little confused, like, Don’t you know I’m practically Therapy Dog material?!!! 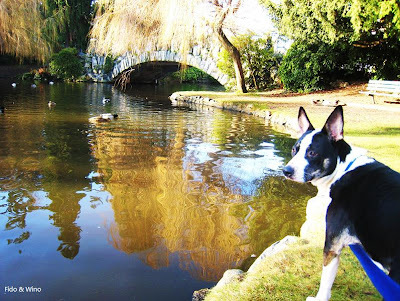 Back in the day at this very same park Mickey discovered ducks as well (here’s a pic). They didn’t like him either. Bitchy, elitist ducks.